THE village community built up by Mr. Richard Cadbury and Mr. George . 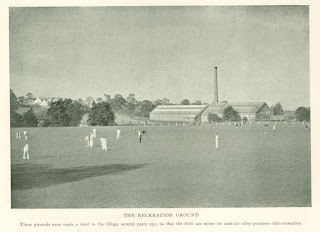 Cadbury, at Bournville, near Birming­ham, England, consists of 400 acres, and con­tains. many cottages for the employees, now numbering nearly 2,000. The lowest rental of these cottages is $1.50 a week, for which the tenant gets three bedrooms, a kitchen, a parlor, and a third room downstairs, and a bath. 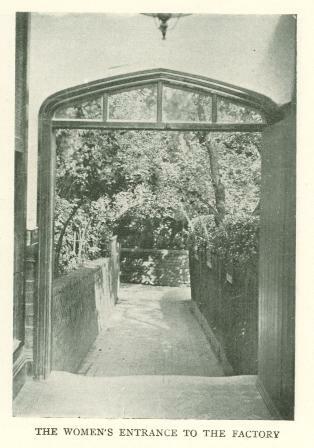 The houses are in the best sanitary condition, and a large garden goes with each house. The village is laid out very attractively with its winding streets, its trees and its open spaces. There is a large recreation ground, swimming pools, a dining room for the girls, a boys' club, light and well ventilated work­rooms. A block of beautiful cottages forming a quadrangle, beautifully kept up with turf and flowers has been set aside for homes of the old or semi-dependent. They are called "Houses of Rest." Each home consists of three rooms and may be occupied by any old lady who can pay, either herself or through relatives, five pence a week. There is also a convalescent home. 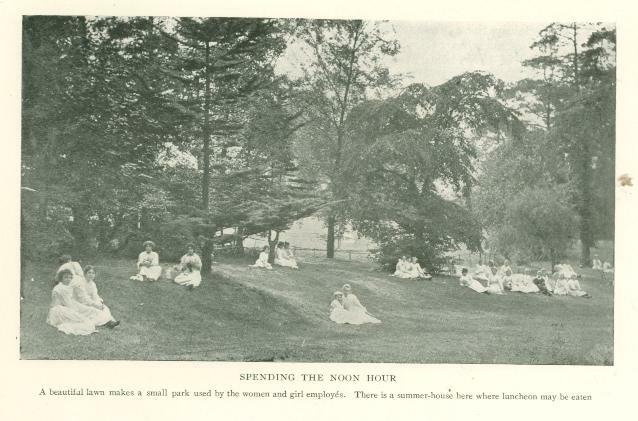 Every summer thousands of children from the tenements of Birmingham are turned loose on the farms and meadows, for a day's fresh air and pure food. The slum workers of the Salvation Army in London also who are worn out with their labors are enter­tained during the summer in one of the houses set aside for their use. For centuries the ancestors of the Cadburys have been identified with the west of Eng­land. Mr. Cadbury's grandfather was for nearly 30 years the Chairman of the Town Council of Birmingham, a position correspond­ing to that of mayor. The father also held offices of public trust. Mr. George Cadbury has been a member of the Birmingham County Council, especially interesting himself in the Health Committee. A trifle more than 40 years ago he became a member of the firm, then employing a staff of twelve. The busi­ness of the preparation of chocolate was not yielding a profit. 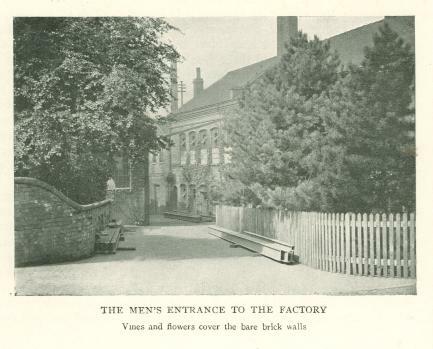 Mr. Cadbury himself worked from seven in the morning till nine and ten at night. He believed in the personal touch of the employer, holding that he should personally see to it that justice is done his employees. I asked if there had been any strikes at the factory. "Oh, no," said Mr. Cadbury, "we all live among our people, we go in and out with them, and we are all friends. They do not look upon us as masters, nor do we consider them our dependents." Richard Cadbury. Who died at Jerusalem, March 22, 1899. This bust was subscribed for by the employees of Cadbury Brothers at home and abroad in loving remembrance of a kind and considerate employer. Such a tribute is more eloquent than any obituary notice or funeral oration. In this factory are nearly 2,000 girls and women, who may buy at cost a warm midday meal well cooked. A man is employed to buy the best fruit in the market at wholesale to get the best prices. The fruit is then sold to the employees at cost. 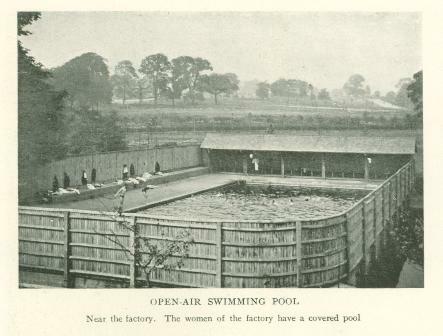 A simple form of entertainment is an open air swimming pool for men, large enough for a good swim. So far all this is interesting as an unusually excellent example of good social life for a working community. But the significance of it is that it has led to and is a part of a unique plan for social betterment-a great Social Trust, which is a new institution, and a new kind of benefaction, planned and managed in a most business-like way, for Mr. Cadbury founded last year what he called the "Bourn­ville Village Trust." In explaining to me the organization, he said, "At present it is in my hands and the hands of my family, but after my death, the trustees may elect a part of their own successors, and three trustees shall be appointed, one by the Society of Friends, one by the City Council of Birmingham, and one by the District Council of Kings, Norton and Northfield. Women are not disqualified, but no more than three may be members at any one time." 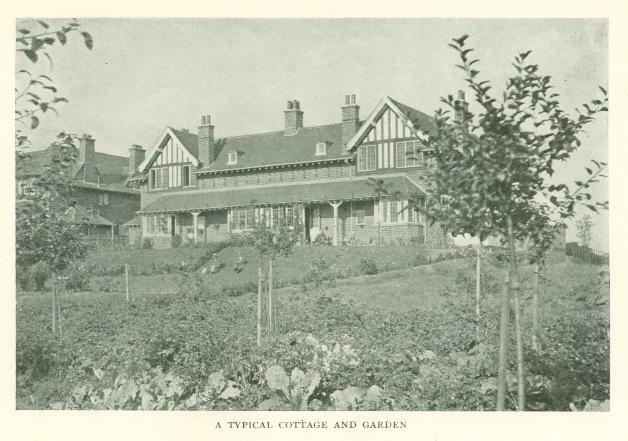 Mr. Cadbury has given to the Trust 330 acres, on which 370 cottages are already built. 143 of these have been sold at cost on leases of 999 years, and the remaining 227 are rented by the week, the rentals being paid into the Trust. The total rent roll is $26,230 a year, and a fair valuation of the gift is $900,­000. "For some time I had the intention of making this Trust, and I consulted with those whose judgment I valued most, in order that the scope of the movement might be as far ­reaching as possible. John Burns was one of my valued advisers." "Will the powers of your gift be confined to Birmingham?" I asked. "No," he said, "the revenue of the Trust may be applied toward the erection or remode­ling of buildings and the acquisition of land in any part of Great Britain, and we can arrange with any kind of a transportation company for cheap transit. I strongly desire that the dwellings shall occupy one quarter of the site, the rest to be used for gardens and open spaces, and I want the rent to be so low as to attract the laborers from the slums, but not in any way to place the tenants as recipients of charity." Any part of the Trust may be used for a factory, but the suggestion is made that not more than one-fifteenth of the total area shall be so built upon. Lodging houses may be built, and whatever concerns the improvement of the families, like lighting, transit and water, may be supplied. Subscriptions may be made to hospitals, providing the amount does not exceed one per cent of the annual net rental. Money may be borrowed on the security of the Trust and land may be given for houses of worship, hospitals, schools, technical schools, institutes, museums, gymnasia, baths, laun­dries, clubs and recreation. Lecture courses may be supported for any educational purpose that tends in the opinion of the trustees to "the health, mental, moral and physical wel­fare of the tenants and their families." Pro­vision is made for any kind of cooperation with public and private bodies. "If there is anyone point I have thought about in every possible way, it is this," said Mr. Cadbury, when I in­quired if he would have the Trust operated in accordance with his own belief and also, what might be the political workings of the scheme. "I have made the Trust wholly un-sectarian and non-political. There shall always be a rigid exclu­sion of all influences cal­culated or tending to impart a character sectarian, as regards relig­ion or belief, or exclusive, as regards politics, and it will be a violation of my intention if participa­tion in its benefits shall be based on the grounds of religious belief or political bias." I was surprised to find the liberal views enter­tained towards the liquor traffic, knowing Mr. Cad­bury's own convictions on this subject and his constant efforts toward the reclamation of men who are the victims of its abuse. "At first I determined to suppress it altogether, but the impossibility of that was proved to me, and I then decided on cer­tain restrictions. None of the buildings shall be used for the manufacture, sale, or cooperative distribution of any intoxicating liquors, except by unanimous consent of the trustees. If we decide to grant any privileges, we may impose any conditions we see fit, with this distinct proviso, that any net profits shall be spent on the enlargement of the recreative features of the village and other counter attractions to the usual conduct of the liquor trade. I hope that the trustees will ever be mindful of my wish that the liquor traffic shall be absolutely sup­pressed, unless such suppression lead to greater evils." The origin of this famous Trust may be said to have dated back nearly 40 years ago, when Mr. Cadbury and his brother began their labors among the wage earners in Birmingham. It was my privilege to breakfast with his son, who is now one of the teachers, and 40 of his colleagues, at 7:30 one Sunday morning, in preparation for the Sunday school at 8:30, when hundreds of men and boys assemble for spiritual help and mental education. These are the men who owe so much to the Cad­burys. "In trying to help these men, who were hard at work all day, I very quickly discovered, that when night came, the only thing offered them was the saloon, as you call it, our public house or 'pub.' In some way I must get these men back to the land, and that is why I locate six of my cottages on an acre, plant­ing fruit trees at the bottom of each garden. We all know the increased yield of land culti­vated on the intensive plan. I am sure that the employee when at work on the land is away from the public house." " Can others than your own people live in your village? " I asked. "Why certainly, there are many men work­ing in Birmingham who cycle home to the pure fresh air of their home in the country, eat the fresh vegetables cultivated by their wives and children, sometimes doing a bit of the garden work themselves. Under such conditions the saloon loses much of its attractive power. "Let us suppose the time has come when the Trust has enough of a credit balance to acquire say an estate of 300 acres. As I told you, I would set aside one-fifteenth for factory purposes, locating say 20 in the centre of the tract, one-tenth of the rest of the land should be set aside for open spaces and the rest to cottages, six to the acre. Then, as now, the workman would be near his work, but what a difference the city slum has made way for the Elysian field of the country, the saloon has given place to the attractions of the home. The strength of England lies in her laborers, but if they work all day and spend their nights in the public houses, the result will be pretty poor. " The establishment of this Trust is of vital importance, not only to the wage earners in and about the Cadbury works, but to the entire country, for land may be bought and buildings erected in any part of Great Britain. As an experiment in housing alone, it will be watched with keen interest, for if Mr. Cadbury alone can do all this, it will be possible for public bodies like town and city councils to do likewise, and the solution of the problem of improved housing will have made a decided advance. From a careful study of various movements for industrial betterment, this one seems to me to be the most comprehensive; it is stable because built upon the confidence and the loyalty of the staff, who have seen the Cad­burys go in and out among them for more than 40 years, during which time they have weighed every act, and they believe thoroughly in everything that is done. The movement has grown slowly, so that it now stands not as an experiment station, but an "application sta­tion." Originally published in The World's Work Magazine. July 1901.